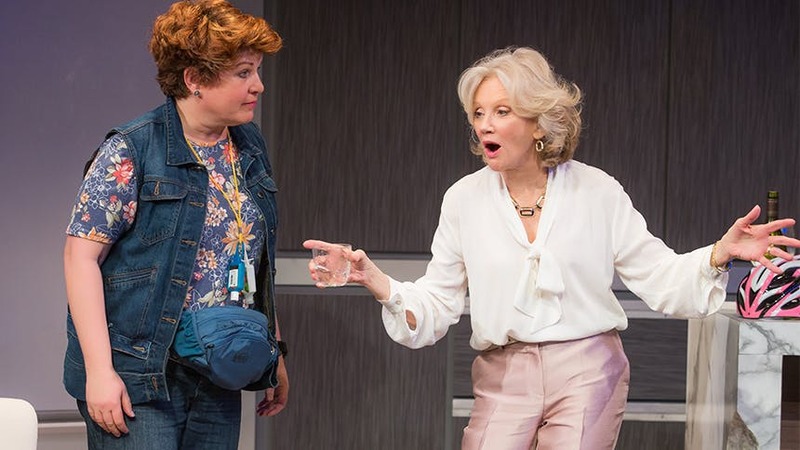 Klea Blackhurst arrives at the end of act one in the funny and moving new play Party Face, but believe me, she is the life of the party and well worth the wait. Klea co-stars (opposite Oscar winner Hayley Mills!) as Bernie, a most colorful and endearing cocktail party guest living with severe OCD. She's an absolute hoot and a total scene-stealer. Scroll on as Klea chats with BroadwayBox about the all-female environment of Party Face, when NYC can expect Hazel the musical, and the Sondheim role she wants to sink her teeth into. 1. How did you find this character and the balance between being so unique but remaining grounded and likable? Well, I know some obsessive compulsive people and I know about their rituals. Counting, labels all having to face the same direction, a need for symmetry, fear of contamination, things like that. Bernie has some of those going on all the time. The goal is to make it tiny, so that no one notices. This character could be an upstaging nightmare. Having a need to count to ten over and over on my fingers definitely grounds me, among a few other quirks. And she's so busy with all of that that she feels guileless to me. I find it pretty easy to get out of her way. A signature cocktail in a punch bowl, a carefully cultivated guest list, and one of those rolling coat racks with hangers. 3. Is there any update on the future of Hazel: A Musical Maid in America? There is actually some exciting news. Keep an eye out for 2019, which is tomorrow in terms of theatre seasons. I'll let you know the minute it's real. I promise. 4. When did you first discover the power and specialness of your singing voice? That's sweet. I guess high school. I wanted to be a professional trumpet player, but I just don't have the chops. It wasn't for lack of practice, I did everything to build up my endurance. I still play, but after 15 minutes I have to take a 40-minute break. This is just not a professional ratio. My high school band teacher, Mr. Frohm, gently encouraged me to take my drama class seriously. I was cast as Mame and discovered I could sing and sing and sing forever. I just kept singing and you know what they say about practice. 5. What’s the happiest you’ve been onstage? Probably Hello, Dolly! at Goodspeed. I can see why Carol Channing said, "You know what? I'm just going to do this 5,000 times and call it my career." 6. How has this experience with a cast and creative team of all women been different than other shows you’ve worked on? This has been the most joyous experience. First of all, it's been years since I was asked to do a play. In rehearsal it seemed like I was always with these women, we never separated into music rehearsal or dance rehearsal; we stayed together and just kept blocking, laughing, talking about the script, ordering lunch etc... It was a safe and open room, filled with laughter. Amanda Bearse was so great with us, just letting us do our thing and then making decisions when it was time. Our stage management team is brilliantly female and everything feels fun and covered and efficient. And we have the best dressing room in show business!! They are fabulous women and I'm so grateful. I find them fascinating and quite lovable. 7. What’s your dream revival right now? What speaks to you about that part? I guess I'll go with Sweeney Todd. I just know there's a Mrs. Lovett in me somewhere. Don't miss Klea Blackhurst in Party Face at off-Broadway's New York City Center through April 8.